PV demand has peaked for the foreseeable future, analysts say. Chinese solar demand peaked last year and is likely to decline from now until 2022. 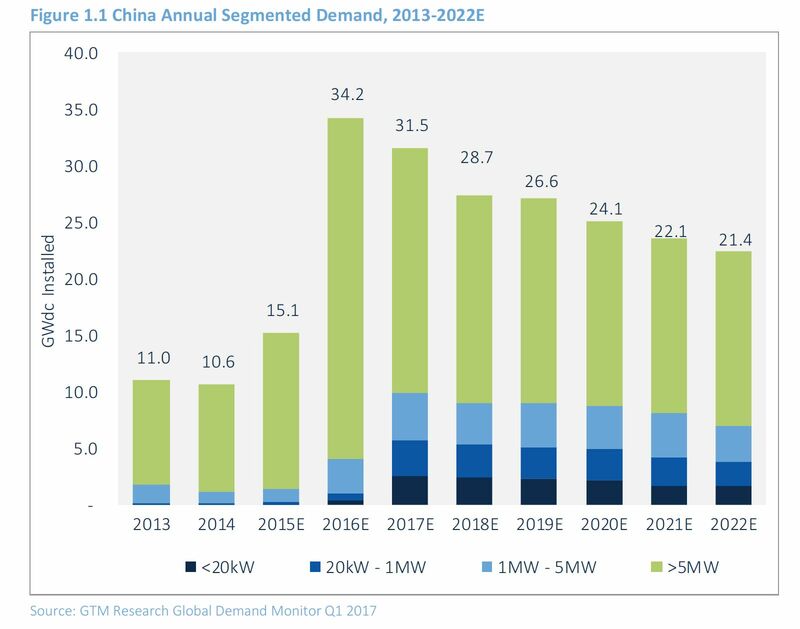 A new research note from GTM Research shows annual Chinese demand for solar PV dropping from 34.2 gigawatts in 2016 to 31.5 gigawatts this year, then falling steadily down to 21.4 gigawatts by 2022. The makeup of the Chinese PV market is set to change significantly as the government bolsters support for plants under 5 megawatts. The policy shift could bring nearly 10 gigawatts of installations sized below 5 megawatts, according to GTM Research. The Chinese National Energy Administration (NEA) is grappling with a growing amount of large-scale solar curtailment. Grid constraints are preventing the country from exporting power from solar farms in the west to the east, making distributed generation increasingly attractive. Analysts believe China will continue reducing feed-in tariffs (FITs) for large-scale solar and replace them with competitive auctions over time. The government could scrap FITs altogether when they come up for review at the end of June next year. "This scenario is plausible, as the NEA may see tenders as a way to cap demand, limit future curtailment, and reduce the China Renewable Energy Fund’s longstanding FIT back-payment issues," write analysts Benjamin Attia and YongYong Ji. Depending on the scenario, the Chinese market will see declines in the compound annual growth rate of between 7.2 percent and 10.2 percent between 2016 and 2022. The drop could have a silver lining for module manufacturers, however. The Chinese solar market has largely been at the mercy of FIT deadlines, leading to massive ramp-ups in demand during the second quarter of each year. As FITs fade from the PV landscape, demand patterns are expected to become more stable over time, making it easier to plan production output. Distributed generation will become increasingly important during the transition in order to bring solar to directly to citizens, while alleviating grid congestion issues. China’s Solar Poverty Alleviation Program could account for 10 gigawatts of PV demand by 2020, according to GTM Research. Households living below the poverty line (more than 70 million qualify) can buy solar panels through a variety of mechanisms, including central and local government grants, public-private partnerships, and relief fund cash tied to private sector funding. The electricity produced by the panels can be used for self-consumption, and any excess can be sold for between $0.04 and $0.07 per kilowatt-hour, depending on the province. 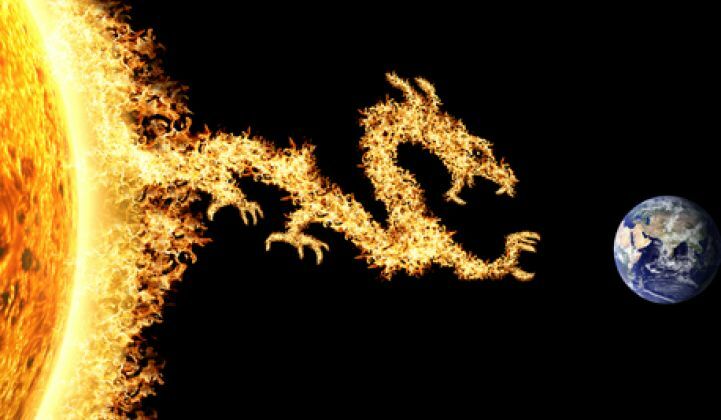 “The program represents the most formalized driver of the DG boom that GTM Research expects in China this year,” concluded GTM Research analysts in a separate research note. Other programs that are helping diversify the Chinese solar market include the Top Runner Program, which encourages the adoption of high-efficiency PV systems, and a potential behind-the-meter DG push that could add up to 9.8 gigawatts of installations this year. Even with this, though, “there’s a significant risk to the global market because the NEA is a huge driver of global demand,” said Benjamin Attia, a GTM Research solar analyst who co-authored the reports. There is one certainty. The FIT structure that led to the world’s largest-ever PV boom for a single country last year is likely on its way out. Get access to all of GTM Research's global solar reports and data with the new Global Downstream Solar Service.